Once enabled, this plugin will insert UserPro related settings under your main point type’s Settings page in your admin area. As of version 1.1.2 the settings have been updated to follow the 1.7 layout. First we need to decide if we want the plugin to insert the users balances in their profiles or if you prefer to do this yourself. If you select to let the plugin insert the balances, you can also select if users can see eachothers balances. If you add in balances yourself, this is instead controlled by the User Field settings in UserPro. If you have the Ranks add-on enabled, you will be given the option if you want to insert ranks yourself or let the plugin do it for you. 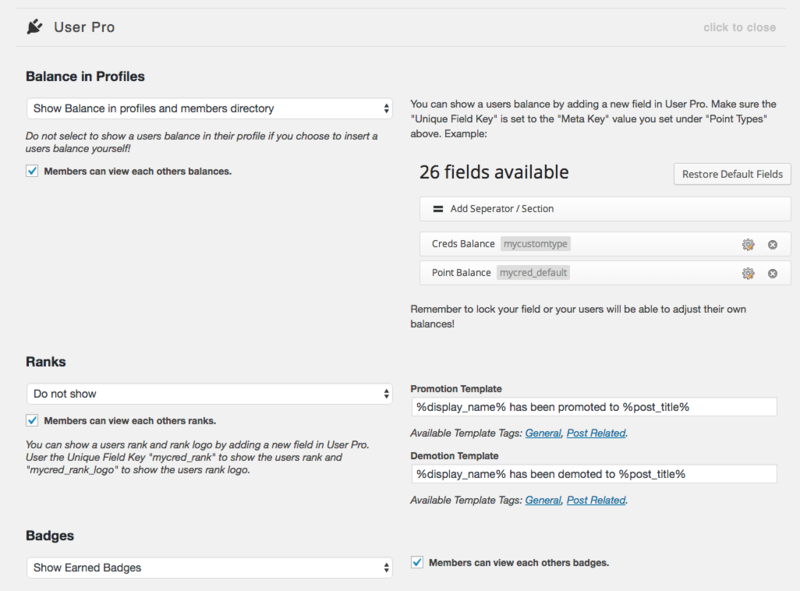 You can also setup the templates that is used when a user is promoted or demoted in their activity fields. Leave these fields empty if you do not want to use this feature. If you have the Badges add-on enabled, you will be given the option to show badges in profiles. You can select to show all badges or just the badges the user has earned so far. Remember to save, even if the settings are to your liking.